My grandson is two; he lives in New Jersey; he doesn’t travel much. For his second birthday, his parents gave him a little brother. I can’t think of a gift with more potential than that. Anything I send is just going to be yesterday’s news within 15 to 20 minutes, tops. I’m not good at picking out gifts anyway, although we got some plus grades for our Christmas offerings. For his second birthday, I sent a package with a few options. First, I found a book with some thick pages, light reading, and some small superhero figurines. It was based on the world of DC, not MARVEL, but it was the only logical choice among the options and it included Batman. I’m not a DC fan on the whole. I still don’t know what Aquaman actually does or why he’s a “Super Friend” but I grew up with Batman and Robin. Thank you Adam West… Thank you! I’m committed to providing young Conrad with all things Batman, even though he seems to like Tickle Me, Emo better at this stage of life. I’m certain he’ll grow out of it over time. (Yes, I know it’s “Elmo” but there’s a story behind the “Emo” designation.) My daughter and son-in-law may not see the value in the barrage of Batman themed gifts throughout the years, but I’d like to point out that he was a bajillionaire and that’s probably not a bad gig. A second gift in the package was a couple of shirts. They may be just a tad large for him at this point, but he’ll grow into and out of them by the time he’s three. As a side note, one that I feel safe adding because neither my daughter, nor my grandson read my blog, I have the same shirts purchased in multiple sizes and he will receive replacement threads each year between now and his 7th birthday. There’s a total of five such shirts in that it’ll-be-awhile-before-you-outgrow-this-one collection. The last thing I included was a bit of a special gift. It’s not suitable for him at this point, nor will it be suitable in a few months or a couple years. He probably won’t get into this gift until he’s at least 12, maybe even 15. How quickly we just teleported through our 10 year ripple in time. Hopefully, the gift makes the complete journey to that distant point of some future day as easily. Hopefully, I make it as well, but only time will tell that story; I can’t just jump ahead and, while I always think the best, I’m not one to assume anything. The best way of guaranteeing that my grandson sees me 10 years from now is to provide his mom and pop with a ripple in time gift to help bridge that gap. The final gift was a movie trilogy – the magical world of LOTR. The three movies sent are the three DVD discs that I purchased one at a time as they were released. Box sets are easy pickin’s. If we’re playing freeze tag with the future, I wanted nostalgia to be a part of it all. Had I thought ahead and planned a bit better, I would have labeled the package as a gift to be opened on Conrad’s 12th birthday. Maybe I’ll remember to do that in the future. I’m pretty sure I can talk them into a memorial re-wrap, if I send a fresh scrap of un-shredded paper. I know what you’re thinking at this point… I thought that very same thing as I looked at the “wide-screen edition” set of DVDs laying on the countertop. Will we still be using the technology needed to play these things 10 years from now? That, my friends, is a heck of a valid question. Default answer: probably not. We’ll probably just ask Alexa or Siri to project something on the wall for us and fill the room with sound. Maybe I’ll wrap a DVD player for him next year as a follow-up insurance plan. On second thought, it might be just as cheap (and a lot more fun) if I send a 3-D printer and the images. My hope is that somewhere, someone in the family has embraced my love of upgrading to new tech only when no other alternatives remain. 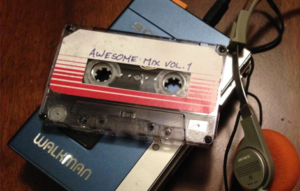 At the very least, I hope that my daughter and son-in-law watched Guardians of the Galaxy and noticed that Peter Quill, aka Star-Lord, could play the mixtape his mom gave him because he had a Sony Walkman. Without it, his connection to his mom would have been forever at the mercy of what a young boy could remember from his past. With it, his mom lives on in all of his adventures. The tape included various hit songs from 1962 to 1986, that’s a 24 year ripple in time, boys and girls. Have I got 24 years ahead of me? Time will tell. I don’t know how it all will play out, but between now and then, I’m going to spit in the face of time every year on February 6th and I invite you to stay tuned while I scramble this omelet.